Quite a few folks following our Competition programming have been wondering whether kettlebell swings should be performed as American Swings, Russian Swings or a hybrid. I have procrastinated an answer for long enough, so here it comes . . .
Let’s take a look at the traditional American and Russian swings first, and then talk about how to determine which of those is best for you, or if there is a hybrid option that might work better. The Russian swing starts with the kettlebell just below the groin (above the knees) and is swung to chest level – approximately a 90-degree angle to the torso. The movement is short, brisk and compact. It is a hip-hinge movement, with roughly 20-degrees (or less) of flexion at the knee. The power of the swing is generated from the hips while the spine is held perfectly stable and neutral. At the apex of the swing, the bell is at chest level, and the athlete’s glutes are contracted, quads are engaged (pulling the knees up), belly is rock solid and braced for impact, and lats are actively pulling the shoulders away from the ears. Additionally, the Russian swing should be performed with rhythmic diaphragmatic breathing – filling the abdomen on the downswing and forcefully expelling through the teeth, while bracing the belly, at the top of the swing. The American swing should differ from the traditional Russian swing only in the finish position. The mechanics of the swing itself should be identical – the bell should pass just below the groin, there should be no more than 20 degrees of knee flexion, the hips should generate the power, the glutes should contract hard, the quads should engage to pull the knees up, and the belly should be rock solid. The difference is simply that the athlete will allow the force produced on the kettlebell to carry it all the way overhead so that the bottom of the kettlebell is directly over the ears, shoulders, hips and ankles. Note, athletes should not be increasing the amount of knee flexion (turning the movement into a squat), nor should they be lifting the kettlebell with their deltoids to assist it into the overhead position. The force is still generated solely by the hip drive, and if optimal force is produced by the hips the athlete will likely have to decelerate the kettlebell as it approaches its apex. The Russian Swing Must Come First! The first thing to understand is that the Russian swing must be the foundational movement. The American swing is a progression the builds from the foundation of the Russian swing. If you cannot perform Russian swings well, you will not perform American swings well. Attempting to jump straight to American swings without a solid understanding of the Russian swing often creates poor habits, like squatting through the movement or pulling up on the kettlebell with the traps and deltoids. So, we must start by mastering the short, concise, powerful Russian swing before attempting to move on to the American swing . . . or a hybrid. My Hips Are Strong and My Swing is Solid . . . Can I Go Overhead? My chief concern when training an athlete is to determine whether they can perform the assigned movements with perfect, virtuous mechanics. Without regard to the particular movement we are talking about, there are a few mechanical principles from which we should almost never deviate. Most notably, our movements should sequence in a wave of contraction from core to extremity, and we should be able to maintain a fixed (and typically neutral) posture. Many athletes lack the mobility to achieve the range of motion required by the American swing. Restrictions in their thoracic spine and shoulder girdle often prevent them from raising their arms straight overhead with a completely fixed and neutral spine. These athletes typically compensate for their insufficient mobility by over-extending at the thoracic-lumbar junction. The example on the left demonstrates over-extension. You can see that compared to the photo on the right, Nichole’s ribcage is elevated and there is excessive curve at her lumbar spine. 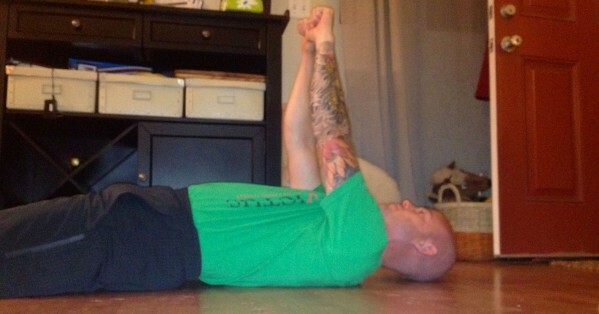 The thoracic mobility to achieve the finishing position without overextending at the lumbar spine. The midline stability and coordination to achieve the finishing position without overextending at the lumbar spine. The discipline to achieve the finishing position without overextending at the lumbar spine. It doesn’t take much for an experienced coach to determine whether an athlete meets the first two requirements . . . the answer to the third question will be answered once the athlete is challenged to maintain good mechanics despite gasping for air and fighting off fatigue. But just in case you do not have a good coach or training partner to help you determine if you have adequate mobility to perform American swings, here is a quick little tool to help you determine whether the overhead/American swing is right for you. 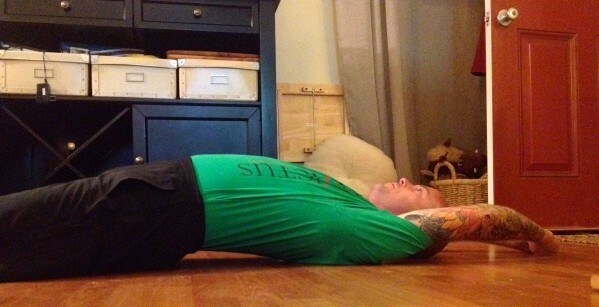 Step 1 – Lay down on your back with your chin and spine in a neutral position and your hands down at your sides. Step 2 – Squeeze your bum and belly and at belly button level interlock your thumbs with your knuckles lined up – mimicking the position of your hands on the kettlebell. Step 3 – Have a partner place their hand between your back and floor. (If you train alone, you can also stage your camera on the floor beside you and videotape this drill.) It’s likely (desirable, in fact) that there will be some space between your lower back and the floor. The more impressive your glute development (think Olympic-caliber sprinter), the larger that gap between back and floor will be. Step 4 – Slowly begin to raise your hands from hip level to chest and eventually overhead until your knuckles touch the ground. Your partner will be there to determine if you change positions at any point. If the pressure on their hand decreases as you raise your arms (i.e., the space between your back and the floor increases) they will stop you. That is the height to which you should swing the kettlebell until you improve your thoracic mobility and/or midline stability. This is a PASS at the standard Russian swing height. This is a PASS at the hybrid swing height. This is a FAIL at the American swing height. I hope and assume that you all are able to pass chest level without losing a neutral spine position. But I am also guessing that not all of you got to the overhead position before you started to hinge and compensate with your spine. That point between Russian and American just before you start to lose your stable midline and neutral spine position is your unique version of the hybrid swing. In our group sessions at Invictus, we will often suggest that most of our athletes swing the kettlebell to eyebrow height. This hybrid swing allows us to provide a common standard that can be met by the vast majority of our athletes. If the coach can see the athlete’s eyes under the bell, they’ve met the standard. It’s a compromise position that we have taken in group coaching, but for athletes training for competition, I want to see them swinging the kettlebell as high as they can without sacrificing good movement, a neutral spine and stable midline. You all might have a slightly different swing height for TRAINING. I am ok with that. If you’re training for health and fitness, determine which swing better fits your training goals for the given day, with the understanding that whichever method you choose must be performed with perfect mechanics. For athletes out there looking to compete in the sport of CrossFit, I suggest swinging to the height that makes the most sense for you and your possible mobility restrictions until just a few weeks prior to the competition season. It will not take long to make the adjustment to American swings, and you will have enjoyed many months of training good mechanics. You will also buy yourself many months to work on your mobility so that when the competition season comes around you can repeat our little test and hit the full range on an American swing with perfect mechanics.